The Ibis Ripmo is a capable, long-travel, 29er with a sporty and athletic feel. With 145mm of DW-Link suspension, aggressive angles, and a relatively sporty feel, this bike is comfortable attacking an enduro race track or grinding uphill on backcountry singletrack. Three testers spent one month charging this wagon-wheeled shredder around the Sierra Nevada Mountains. The Ripmo is a fantastic aggressive trail/light enduro bike that retains a lively and nimble feel. This bicycle climbs remarkably well thanks to an incredibly steep seat tube angle, loads of traction, and an efficient pedal platform. The feisty combination of a 160mm Fox 36 and 2.5-inch Maxxis Minion DHF ensures confidence when rolling into a dose of gnar. At high speeds, the Ripmo offers excellent stability and a planted feel. Our GX Eagle test bike retails for $4799 and has some desirable components along with some weak ones. High-end performance can command a high price tag. It is easy to call the Ripmo a solid value. The Ripmo remains unchanged for 2019. October 2018. Ibis Ripmo vs Santa Cruz Hightower LT Which one is right for me? Three testers spent a day riding the Ibis Ripmo back to back with the Santa Cruz Hightower LT. Make no mistake, these bikes are some of the very best options in terms of long travel 29ers. We don't say this often: these bikes are both fantastic choices for the aggressive rider. That said, they have inherent strengths and weaknesses. The Ripmo has a mean front end that exudes confidence. The Ripmo is a high-end, light enduro/aggressive trail, bike. It is an excellent option for the rider who wants aggressive geometry with a sporty design. This bike has a mean attitude in rock gardens and steep trails while retaining an athletic and sporty feel. The combination of hard-charging abilities and a lively, finesse, feel is very difficult to come by. Riders who want long travel capability with mid-travel snappiness, handling, and acceleration will love this bike. The Ripmo is not the best choice for full days in the saddle given its long wheelbase and burly feel. While it is no doubt a very efficient climber, it proves a little grueling on 30+ mile rides. Best For: Riders who want enduro performance while retaining sharp handling and excellent climbing abilities but don't mind pushing around a big and mean front end. The Santa Cruz Hightower LT feels more like a trail bike compared to the Ripmo or SB5.5. This 150mm travel 29er sets riders up in a slightly higher position. Where you feel like you are sitting in the Ripmo and SB5.5, it feels like you are on top of the Hightower LT. This bike is a very effective climber and has a light feel that is definitely the best choice for 30+ mile rides. The suspension is very firm under pedaling loads and very little energy is wasted into the suspension when climbing. The downside is that the firm pedal platform can be detrimental to traction on technical sections of trail. The more active suspension on the Ripmo and SB5.5 help maintain contact between your rear wheel and the trail, even if it feels like the suspension is bobbing more. On the descent, the Hightower LT is very supportive deeper in its travel. It doesn't have the small bump compliance of the SB5.5 or Ripmo, but it stands up far better on bigger and burlier lines. Best For: Riders who want a long-travel 29er that is capable and efficient but doesn't feel like a full-on enduro bike. The wagon-wheeled, 140mm, Yeti SB5.5 is an excellent choice for riders who encounter large amounts of chatter and small rocks. Outright climbing efficiency can't match the Hightower LT or the Ripmo. The rear end tends to move up and down a fair bit under rider weight. While it feels like you are losing energy into your shock, it is beneficial on rough and rocky climbs as your rear wheel maintains excellent traction. The SB5.5 is an effective climber up any gnarly and technical climb. The Yeti SB5.5 X01 Eagle. On the descent, the 5.5's active rear ends creates a smooth and buttery feel over small bumps. The active suspension gobbles up small rocks and roots and then asks for seconds. On bigger impacts, the 5.5 isn't as supportive as the Hightower LT. When getting on the gas out of turns, the 5.5 lacks the sporty and responsive rear end of the Ripmo. Note: we expect to see a redesign of this bike within the next year. Best For: Riders who like active suspension and ride trails with substantial amounts of technical climbs and like motoring over rocks. The Ripmo features DW-Link suspension. This is a dual link system with one link located above the bottom bracket and another approximately halfway up the seat tube. Both links rotate in the same direction as the bike moves through its travel. This design offers excellent pedaling efficiency and functions well under braking forces. One downside is questionable small bump compliance. This bike boasts a clean and minimalist look. Our large Ripmo GX has a measured 628mm effective top tube and 473mm reach. The chainstays measure 436mm and the wheelbase is 1220mm. The head tube angle is 65.8-degrees and the seat tube angle measures a steep 76.1-degrees. The bike hit the scales at an impressive 29 lbs 7 oz without pedals or tubes. We highly recommend sitting on this bike before pulling the trigger. The reach numbers are generous but the steep seat tube angle makes the cockpit feel tighter than the reach number suggests. In addition, the short seat tube makes setting saddle height difficult. Our 6'2" tester had the post raised to the minimum insertion point to find a comfortable pedaling height. No matter how loose or dusty the trail, this bike tracks well. The Ripmo is a confident descender that lives for high speeds and offers excellent stability. This sleek shredder has the angles and attitude to inspire riders to feed it down gnarly and steep terrain. Cornering abilities are excellent and the sporty rear end provides a lively ride. The Ripmo has a sporty and responsive rear end. The DW-Link suspension is effective and supportive and remains very athletic. This is not the kind of bike that has a pillowy and bottomless feel. The 145mm of suspension is a little tighter and firmer compared to some longer travel enduro bikes such as the Evil Insurgent, Santa Cruz Nomad, or Commencal Meta AM. This creates a more responsive and nimble feel. It is easy to load the rear end up and hop in and out of rock gardens or to get a little playful. The front end is mean and capable. Take an ultra-aggressive Maxxis Minion DHF 2.5 WT and pair it with a burly 160mm Fox 36 fork. The result is an extremely confident front end that inspires riders to attack aggressive or steep lines. The Ripmo offers excellent stability at speed. This bike was impressive motoring through chatter and chunder. The bike remains in control and impressively quiet. It was relatively easy to find shock pressures and rebound settings that worked well on the Fox DPX2. Steeper terrain doesn't deter the Ripmo and riders should be confident rolling into any chute. Larger impacts were less composed. This is by no means a debilitating flaw, but bigger hits have the ability to shake the confidence of the Ripmo. The Hightower LT has far better deep stroke support. This bike operates well with a dose of speed. The long geometry paired with the feisty tires instills confidence. High-speed cornering abilities are extremely impressive. Even on loose and sandy corners, the 2.5-inch Minion DHF WT pulls the bike through. No matter the trail surface, the Ripmo rails corners. Given the width of these tires, testers ran pressures as low as 21-22 PSI. The 34mm Ibis hubs provide an excellent footprint. Traction was fantastic over everything from loose, sandy trails to off-camber roots and rocks. Despite the mean front end and 1220mm wheelbase, negotiating tight downhill turns is easy. Slow speed handling is solid despite the slack front end. The Ripmo is a relatively user-friendly bike. This bike doesn't fall into the same category of super-enduro bikes like the Santa Cruz Nomad that requires a super aggressive pilot or mach speeds. Anyone can enjoy this bike and it doesn't require huge amounts of body language or muscle to slap it into turns or maneuver over obstacles. There is no denying the Ripmo feels better and better at high speeds, but it isn't a requirement. Two testers noted that the Ibis branded bars have a large, 9-degree, backsweep and provide a disconcerting, twitchy, feel. This bike inspires you to just point it down some gnar. The 160mm Fox 36 Performance fork is confident. The Performance model comes with a GRIP damper as opposed to the more adjustable GRIP2 damper or Fit4 found on higher end Fox 36 models. This fork worked well enough on this bike and provided a stiff and supportive feel. The 2.5-inch Maxxis Minion DHF WT front tire is a tremendous specification as it only adds to the already confident front end. The fast-rolling Maxxis Aggressor 2.5-inch rear tire rolls fast while still offering sufficient braking bite. A few components that stood out as weak on the descent were the Shimano Deore brakes and the Ibis handlebars. The Deore brakes simply weren't powerful enough to confidently shut down the speed that the Ripmo craves. The Ripmo is a very impressive climber in or out of the saddle. The Ripmo is a stellar climber. This burly bicycle has an pleasantly calm and firm pedal platform that doesn't sacrifice traction. The frame geometry is excellent for putting power down and retains reasonable handling despite its slack front end. The component grouping works very well on the inevitable uphill grind. This bike has a steep 76.1-degree seat tube angle that puts rider smack dab on top of the cranks. Typically, the more aggressive bikes have slacker seat tube angles which position the rider slightly behind the cranks and is detrimental to power transfer. The Ripmo puts you in a great place to maximize power transfer. The front end of the bike is big and slack but doesn't seem to negatively affect climbing position. The 343mm bottom bracket height helps this bike cleanly crawl over rocks and roots and largely avoids pedal strikes. Climbing traction is exceptional thanks to a solid pedal platform and wide rim/tire combination. On the ascent, the Ripmo works quite well with the shock wide open. In or out of the saddle, the bike is reasonably calm and resists bobbing. Anti-squat is a technical design term to describe how a bike reists pedal bob or bouncing. High anti-squat numbers are nice but can sometimes be detrimental to climbing traction. A prime example of this is how the Yeti SB5.5 has less anti-squat and a more active suspension design. The Yeti provides great climbing traction over technical terrain. The Santa Cruz Hightower LT has much more anti-squat, and while it is an efficient pedaller, traction can suffer on technical climbs. The Ripmo splits the difference and blends a very efficient pedal platform with excellent traction. It should not be overlooked that some of this is likely due to the wide tire/rim combination and lower tire pressures. Navigating uphill rock gardens is reasonably confident and easy. Given the slack geometry and relatively shorter 436mm chainstays, the front wheel can lift and wander on steeper pitches. As with most enduro/aggressive trail bikes, tight uphill switchbacks can require some attention. A clean and crafty entry goes a long way. Working through tight spaces can be tricky, but a well laid-out gameplan goes a long way. The component grouping on our GX Ripmo worked well on the climb. The GX Eagle drivetrain is always a favorite. A light, 30:50-tooth, climbing gear offers an airy and relaxing bailout gear on long climbs or epic days. The Ibis 938 rims feature a 34mm inner diameter and create an excellent footprint. The Maxxis Minion DHF and Aggressor 2.5-inch tires are no featherweights coming in over 1000 grams each. We feel it is worth pushing some extra weight for the added downhill performance. Weight weenies could consider some narrower rubber to help create a lighter feel. Our Ripmo GX retails for $4,799 with a build kit that features the typical highlights and lowlights. 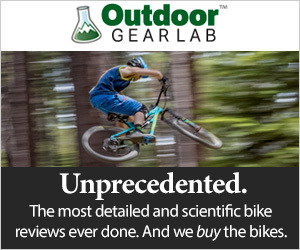 Given the fantastic on-trail performance, it is easy to call this bike a strong value. Yes, you can find a bike with similar geometry travel numbers at a lower price, but the Ripmo offers truly high-end performance with a dialed suspension design. The cost of entry is lofty, but for riders seeking top-notch performance, the Ripmo should be on your short list. Hop aboard the Ripmo and start pinning. Ibis took a sporty and athletic approach with their entry into the popular long-travel 29er category. The Ripmo has all of the aggressive angles to attack an enduro race course while retaining a snappy and sharp-handling personality. We love it. If you're searching for a capable daily driver that retains impressive climbing abilities, the Ripmo is worth a look.